When are mangoes ready to eat? Where do my mangoes come from? Start by making a mango hedgehog but without turning mango cheeks inside out. Heat and lightly oil the BBQ hotplate, add the lamb (seasoned with salt and pepper) and mango cheeks making sure the mango is flesh side down. 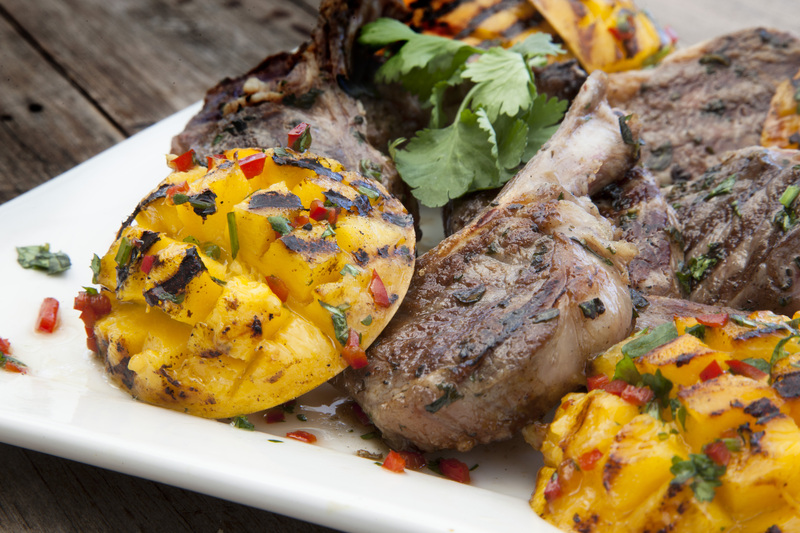 Cook lamb to your liking and the mango until it is caramelized. For the dressing, combine chili, coriander, lime juice and stir in sugar to taste. To serve turn mango cheeks inside out and place on a large platter with cooked lamb, drizzle with dressing and serve. Horticulture Innovation Australia Limited (Hort Innovation) is a not-for-profit, grower-owned Research and Development (R&D) and marketing company for Australia’s $9 billion horticulture Industry. Hort Innovation invests more than $100 million in R&D and marketing programs annually. © 2019 Mangoes Australia. All Rights Reserved.